This is Matthew McConaughey's year! Not only has the actor earned much-deserved critical acclaim for his role as Detective Rustin "Rust" Cohle in HBO's drama True Detective, but he collected an Oscar Award on Sunday night for his role in Dallas Buyers Club. What's next for the actor? Well, we know he has Interstellar lined up and he'll possibly reprise his role as Dallas in the Magic Mike sequel. That's unconfirmed, however what is confirmed is that he won't be returning to True Detective for the second season. Even if the series' plan is to reset the story each season, focusing on a new crime situation and new detectives, that doesn't necessarily rule out some returning actors. American Horror Story is an example of a drama that takes the anthology approach with its format, and the FX drama regularly recycles its excellent acting talent, recasting Jessica Lange, Lily Rabe, Sarah Paulson and other series vets into new roles each season. So it wouldn't be impossible for McConaughey, Woody Harrelson and some of the other cast to return for new roles. But in the case of McConaughey, it seems it's just the one season for now. True Detective currently stars Harrelson and McConaughey as two detectives, each with their own personal baggage, as they recall a murder investigation they worked on together years ago. The entertainment value of the drama extends beyond the hunt for a killer, as the outstanding performances of its cast and the devolving relationship of Harrelson and McConaughey's characters has made for some gripping television. It lives up to the hype, so if you haven't watched it yet, be sure to check it out on HBO Go, as the first season is headed toward its final episode. It'll air this Sunday night on HBO. And we'll continue to wait for some updates on what HBO has planned for the series beyond its first season. 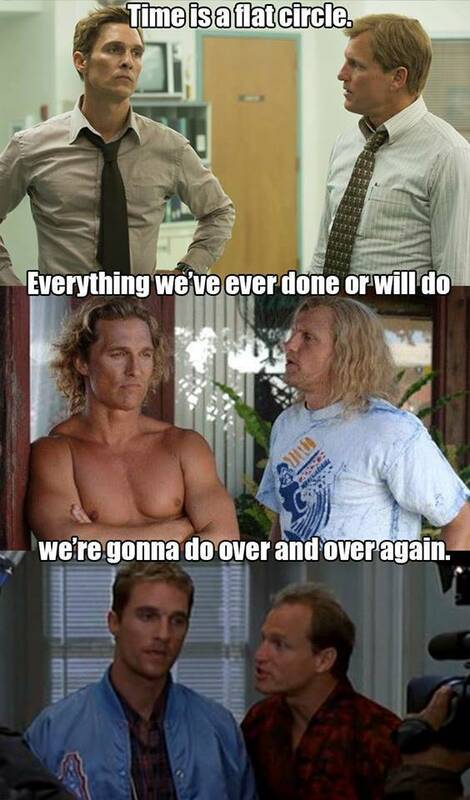 While we wait for that, we have Imgur to thank for this meme, which captures the greatness of Rust's wisdom combined with the greatness that is the the McConaughey/Harrelson team-up. For these two, I guess time is a flat circle that loops around EDTV, Surfer Dude and True Detective.